Okay, so I can keep a straight face while writing most of this review, but I gotta admit, I really had to restrain my inner Beavis and Butthead every time I thought about using the phrase "nut butter." Uh huh, huh huh huh indeed. Anyways, I've been interested in following a paleo (or at least paleo-esque) diet for quite some time, right after I finish my next quesadilla. Finally, a couple weeks back, I decided to give the cavemen cuisine more of an honest try, with almost immediate dividends: With a little exercise mixed in, I've dropped over 5 pounds in the past two-plus weeks. 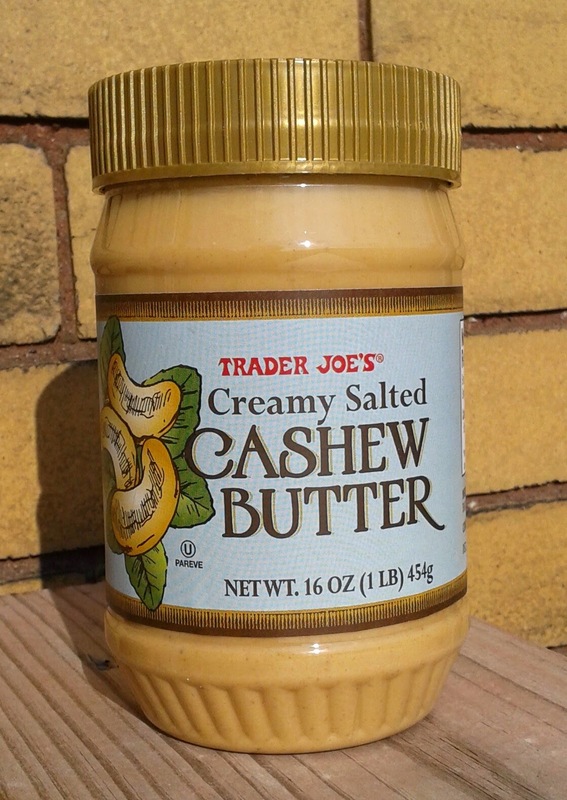 Now, I'm not a paleo diet expert by any means, so I cannot ascertain how closely Trader Joe's Creamy Slated Cashew Butter aligns with it, but I know it's much closer than regular old peanut butter, which I love. So, I figured, why not give it a try as I learn the ropes? I've gone back and forth about my feelings about this particular nut butter (Stop it, Beavis!) several times. A minus: It's very oily and drippy when opened, closer to a sauce than an actual butter. No amount of stirring will resolve that. Just my preference talking, but me no likey. A plus: After being refrigerated for a good long time, the butter does solidify quite nicely. Another plus: Lots of good, honest cashew flavor. Another minus: Tastes pretty salty at points, especially while swallowing,, would be better without as much. What's good - reasonable price for a pound of cashew butter, $6.99 vs $10+ bucks I've seen elsewhere. But you can make your own, as I have, for cheaper as long as you have a decent food processor. A one pound back of busted up raw cashews cost $5 at TJ's, so the extra two bucks goes towards grinding (easy enough with some patience) and adding extra stuff which like the salt, sunflower oil, and, of all things, almonds for who knows what reason. There's always a price for convenience. The butter tastes about what you'd expect a handful of salted cashews to taste like, overall, so not a bad product, but I kinda like what I can grind myself better. 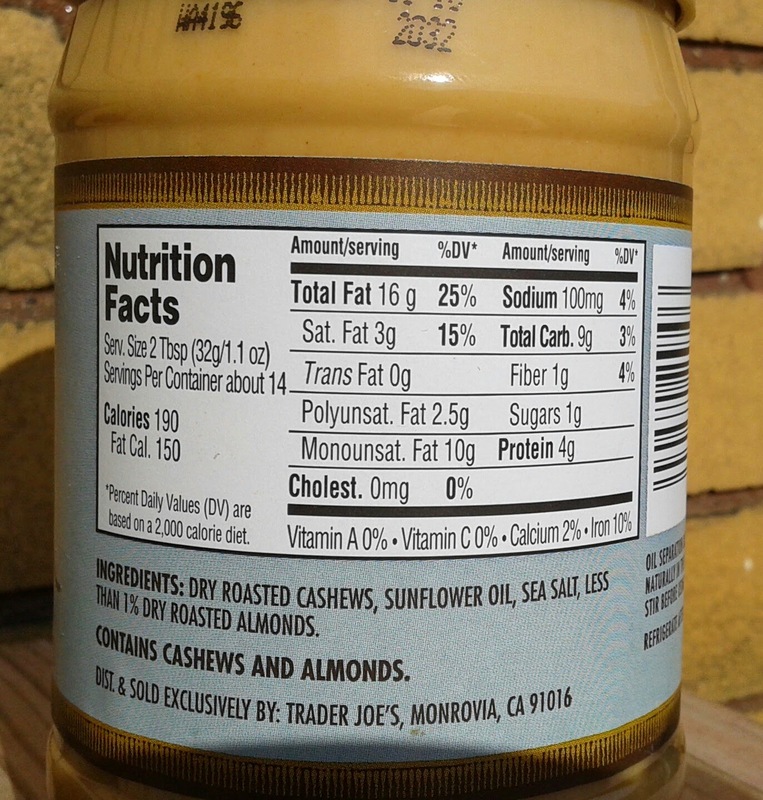 Initially I thought about retuning for a refund but have since changed my mind.I hate drippy nut butter that much, and what I can make out of my Oster is chunkier, heavier, less oily, less salty, and shows off the natural goodness of a cashew than this jar of TJ nuttiness. The jar's gotten better as I' ve come along, though, and now I've put some in smoothies or dipped some apples into or spread atop some banana slices. I'm not crazy in love all Beyonce-style about this cashew butter, but I don't hate it either. Sandy's in much the same boat - she stated she liked but a half-hearted "ehhhh" is about what she said. Using my spousal translation skills to use, I think that means a 2.5. For me, I think it's a better butter to not be bitter about - it stays in my kitchen with a 3.5.